I loved Angie's coral, blue and white ensemble and knew I was going to wear that today. I started with my white BF shorts and added my wide white leather belt. I then chose my white and blue floral tee, semi tucked. For shoes I went with my Vans and then my coral-watermelon shade handbag. No makeup today as I like to give my skin a break from it every once in a while. This could also have been titled something like "Sporty for the Office". When I saw Angie's blog post about sneakers with a skirt or dress, I wondered if there was a way this could be worn for work. Then I thought of my pinky-red Vans. I prefer the look using a sneaker without laces - a sleeker, slip on style. So today's outfit started out with my Vans - it's fun starting an outfit with footwear, don't you think? I then chose my EF black drape front dress. The beauty of this dress is how easily it can be dressed up or down. It is unbelievably versatile. 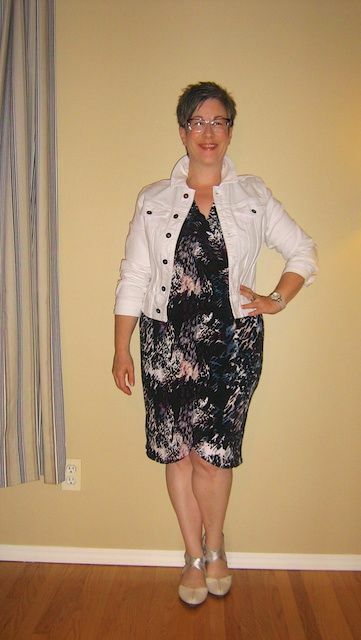 On top of the dress, I added my floral silky bomber jacket - adding a bit of sporty luxe to the outfit. Accessories are simple with my black leather handbag (I actually would have preferred my sleek black patent clutch but needed a larger bag today), silver wedding band and my purple/clear specs. Happiness scale? Off the charts! I love how this is sporty but feminine and in my office, still very appropriate. Would love to know what you think of this outfit. As always, all comments/suggestions welcome. Today's outfit started with my slim leg EF cropped pants. I enjoy wearing these both unrolled (as they are today) and rolled, to be capri length. I paired the cropped pants with a wrap front, black/white stripe sleeveless blouse. 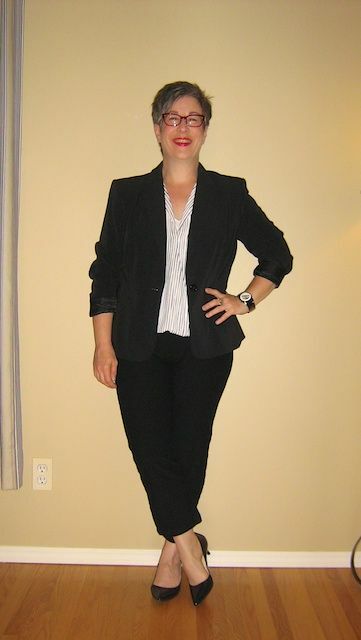 I then topped that with my black blazer (from my skirt suit) to make a pseudo suit. I added my kitten heel pointy toe pumps and my black leather handbag. Red specs and red lipstick, as well as my large silver/white watch finish off the outfit. I think black and white will always be my favourite combination to wear. I adore the high contrast. My favorite eBay seller has for sale an Eileen Fisher waterproof trench in Primrose color that I have been looking at off and on. I have included pictures of both the stock photos as well as the real photos of the trench up for sale. It is new with tags and IMHO, a very reasonable price. depending on the weather, that it's 100% water and wind proof, and I adore the back gather which helps to give me shape. My only pause is the color - although the primrose works well with my hair and skin coloring, I'm wondering about versatility. That having been said, my only other coat for fall and spring (before getting into the heavier winter coats) is my navy London Fog which is a completely different style. The EF jacket in question is a Petite Large. I wear both medium and large in EF depending on the item and I think the petite large would allow layering of my various blazers, etc. What do you think of this color and style for me? P.S. Yes, I am beginning to think of fall. Fall/winter are my dominant seasons and I'm learning to buy a bit at a time for it to ease the "all at once" budget pain. It's cool and rainy today so I started my outfit with this EF hemp blend white v-neck pullover. I adore its drapey, almost misshapen, feel and look. Of course I have to wear a white cami underneath but today chose a full blown white tank top for a layering effect. I then paired that with my black slightly slouchy trousers and my black heeled sandals. To finish off the outfit, I chose my black leather handbag and put on the silver necklace that hubby had made for me for Christmas (by the same guy who made my 50th birthday necklace). This is a silver rendition of the Canadian maple tree that grew outside my bedroom window of my childhood home. My hubby took a picture of the tree that I have and had it made. Very special. So what do you think of today's outfit? Simple good or simple boring? As always, all comments/suggestions welcome. BTW these very inexpensive slouchy trousers have got me thinking seriously of buying a better brand (with a slightly longer hemline) for fall. Any suggestions? 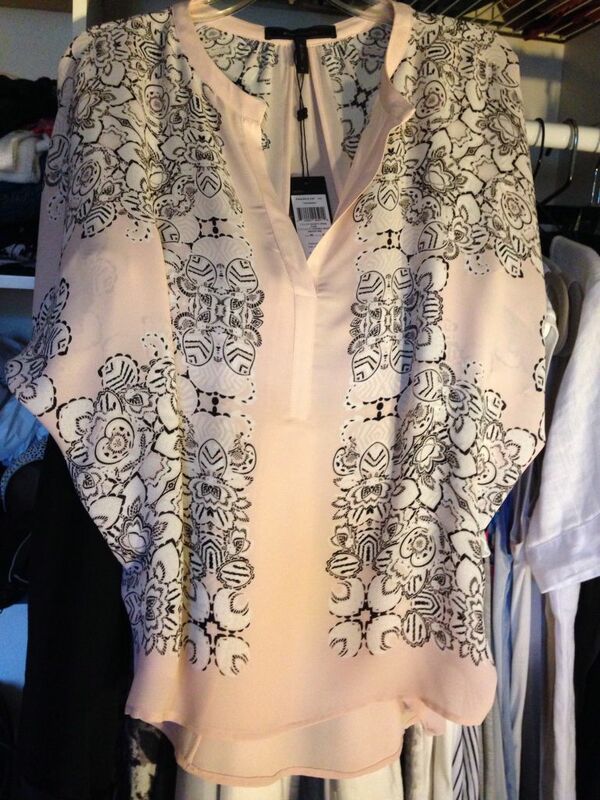 When I saw this BCBG blush pink blouse in Angie's Spring and Summer Tops picks, I fell in love BIG TIME! I loved the shape, the drape, and the soft colour combination. Well I bought it in this weekend and there is no time to waste in wearing it! 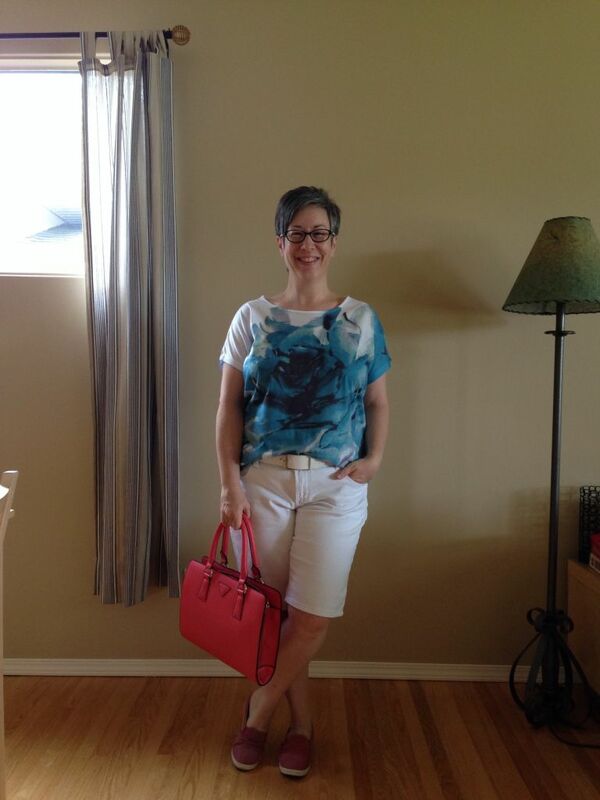 I've paired this gorgeous blouse with crisp white jeans, rolled in BF style. I chose my bone/silver sandal shoes for footwear and my simple white leather clutch and a grey/silver enamel bangle for accessories. Earlier this week I had posted about a black leather vest from Danier that I had been crushing on. Sorry I can't link to the post - on my phone. I went tonight and tried it on to get it out of my system. It's a gorgeous vest with that great Danier quality and the gold hardware is classy. But it is not cut for gals with narrow shoulders and who are petite. The underarms are much too deep and the shoulders were wide to the point that the fabric went past my shoulder and I looked like I was wearing epaulettes. So I walked away. On a whim I popped into BCBG to see if they had that lovely drapey blush/black/white blouse Angie had shown us earlier in the season. I normally don't even look in BCBG because their clothes are not made for petites or women with a larger midsection. But I thought what the heck - I'm already out and about. They had the blouse and it's even prettier in real life and has such wonderful movement. I tried the large and the medium and actually the medium was perfect. The blouse is cut generously. As Angie had mentioned, it can be worn untucked in all its glory or tucked. It was 50% off and I bought it. It is not a need and a total "love" purchase. And I couldn't be more pleased. And DH thinks it's beautiful. Already in my pj's so no pics on but you'll see it in action next week. Love the idea of pairing with a voluminous tunic and ankle booties for fall. Still fashionable? Or old news? 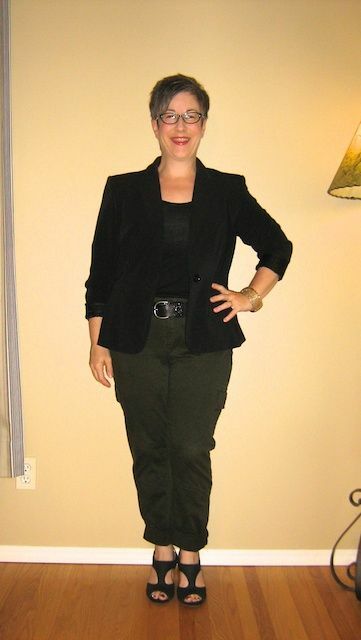 Today's outfit started with my olive cargo pants - this time rolled to look more like a slim BF. I love how they work with my black high vamp sandals this way. And because of the high vamp on the sandals, I don't feel this shortens my leg line at all. I added to the cargos and sandals a simple black tank, fully tucked with a black leather belt. I then topped that with my black suit jacket, with sleeves rolled and scrunched. I like how the rolled cuffs of the cargos and the rolled cuffs of the jacket mimic each other. I chose my black patent leather slim clutch for my handbag to add a bit of sleekness to the outfit and for jewelry, went with my gold wedding band and a gold mesh bangle. Specs are my black/white pair. Love how the mesh of the bangle works with the laser cut outs in the sandals. I'm thrilled with how this turned out. What do you think? Does it all work together? As always, all comments/suggestions welcome. Well the watch is relatively new. I still love each of these "not new" pieces and hope they still look relatively fashionable. What do you think? Does it all still work? As always, all comments/suggestions welcome.